Last week, we brought you the details on the all-new 2019 Ram Heavy Duty lineup. The biggest news for the redesigned trucks is the introduction of a new Cummins Turbo Diesel engine that delivers 400 horsepower and 1,000 lb-ft of torque, making Ram the first company to offer a production road-going vehicle with four-digit torque levels. Today, we bring you a look at the changes made to the 6.7-liter Cummins engine to yield this monster torque output, along with the improvements made to allow the 2019 Ram HD to make the most of all of that power. The Cummins Turbo Diesel engine offered in the 2019 Ram 2500 and 3500 comes in two forms – standard and high output. The standard diesel engine offers 370 horsepower and 850 lb-ft of torque while the high output version delivers the groundbreaking figure of 1,000 lb-ft of torque along with 400 horsepower. This new engine starts with a new engine block, made from compacted graphite iron. This material is more durable than a traditional iron, so this new diesel mill has less material, thus being lighter without any compromise in durability. That new block houses a revised rotating assembly that features new, low-friction pistons, stronger connecting rods, a stronger crankshaft and bearings that will handle the extreme temperatures and combustion loads of a diesel engine making 1,000 lb-ft of torque. On the bottom end, the oil pump and water pump systems have both been revised to keep everything running cool and smooth. 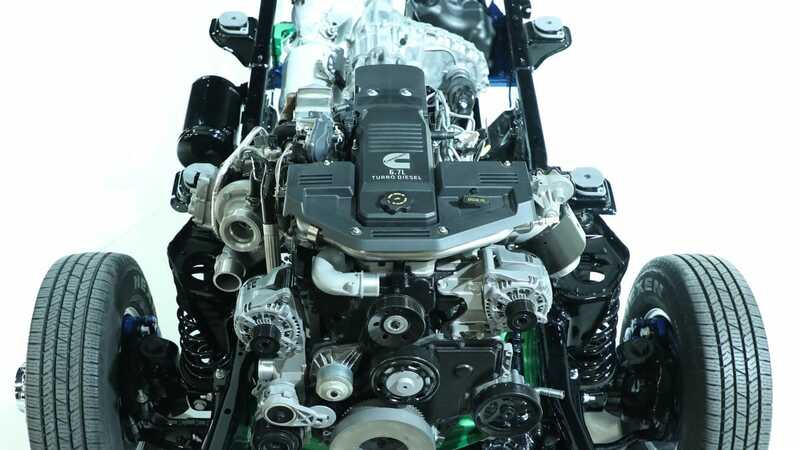 On the top end of the engine, the engineers have added a new cylinder head design with new exhaust valves, new rocker arms and a new fuel system that operates at 29,000 pounds-per square inch; providing plenty of fuel pressure for the boost needed to create monster torque. There is also a new exhaust manifold and a new variable-geometry turbocharger that provides 33 pounds of boost in the high output engine. For those wondering, the standard 6.7-liter also received many of the new features of the high output engine, including the engine block, the cylinder head, the cooling system, the oiling system and the turbocharger, although the stronger engine has a unique calibration with more boost and less cylinder compression to reach the big torque levels. So, the new 6.7-liter Cummins diesel engine is pretty much all-new inside and out, but the company wanted to make sure that the trucks could make good use of the ensuring power. In addition to the revamped water pump, the 2019 Ram HD has a larger radiator which required the massive grille opening to make sure that there is plenty of cooling air flow. Next, to handle all of that diesel power, the Ram engineers designed two different automatic transmissions, including a new-and-improved Aisin unit in the high output models. The transfer case, driveshaft, differentials and frame have all been tweaked as well, making the most powerful truck in the segment the most capable as well. Finally, all 2019 Ram Heavy Duty trucks come with new 8-lug axles and wheels, designed to handle the work performed by these class-leading pickups. So, to answer the question “what did the engineers change to get to 1,000 lb-ft of torque”, the answer is “pretty much everything under the hood”. To answer the question “what else has been upgraded to handle that power”, the answer is, once again “pretty much everything”.